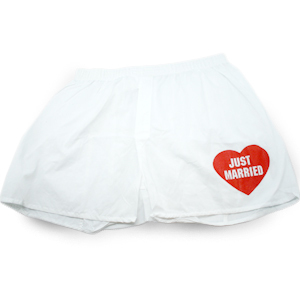 What says honeymoon or just plain celebration like these 'Just Married' Men's Boxers. Forget scribbling on the car windows or flags on the house, this is the way to go. 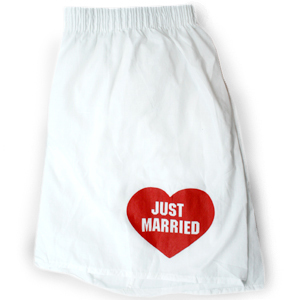 Since you seem to have a tendency of exposing your underwear to the world lately, you're sure to make an impression with these. Even if the only person seeing these is your husband or wife, bells will be ringing and doves will be singing. If you love Marriage or love pretending to be Married, we think you've met your cotton-poly blend soulmate.